Great for children 9 years and younger! Register in-person to receive the Addison resident rate. Addison community members will receive Bloomingdale resident rates but will have to wait until nonresident registration opens to enroll. Register in-person to receive the Addison resident rate. Registration begins April 23. Addison residents will receive 50% off the nonresident fees for parties and rentals. If the renter is a season pass holder, an additional 10% will be deducted from the party or rental. Daily Admission Before 5:00 p.m.
Daily Admission After 5:00 p.m.
Addison community members will receive Lombard resident rates. Registration begins May 8. No rate adjustments. Birthday parties include admission to the facility, use of a reserved party area for 3 hours, and lunch for 14 guests for $253. Each additional guest is $18, with a maximum of 20 guests. Birthday child is free. Daily Admission Weekdays 12:00-7:30 p.m. 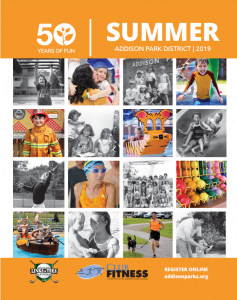 Weekends 1:00-8:00 p.m.
Addison community members will receive Wood Dale resident rates but will have to wait until nonresident registration opens to enroll.